They say not to judge a book by it’s cover. That is true, for with Fade to Black even though the cover drew my attention the story struggled to keep it. It felt a bit like paint by numbers where plot points were being ticked of a list. Rojan Dizon is a bounty-hunter in the city of Mahala, a city ruled by the opressive Ministry. The Ministry is the new ruler after they did away with the old regime. Pain mage’s use to rule using their magic to fuel the city. The Ministry replaced their magic with ‘synth’ but people started dying slow, horrible deaths so ‘synth’ was replaced by the cleaner, safer ‘glow’. Rojan himself is a pain mage and that makes him good at his job. Rojan I found was the stereotypical male detective / bounty-hunter. Womanising, likes beer and generally rough around the edges. The story kicks off when his brother’s daughter is kidnapped and Rojan is put on the case to find her. His search takes him into the bowels of Mahala. I really liked the city as it is a character in its own right, and no matter where you are in the story, the city is there always looming around and above you. The story read like a YA book though some of the themes makes it unsuitable for that group of readers. All in all I was a bit disappointed as I read a blurb promising a combination of “the fantastic imagination of China Miéville with the murky atmosphere of Sin City.” and it just fell short. 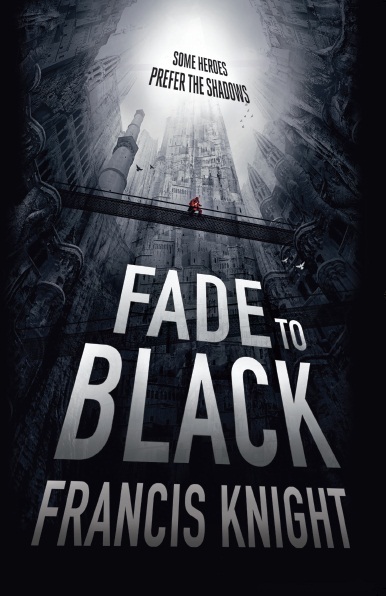 To order your copies of Fade to Black, click here for Amazon US, here for Amazon UK, and here if you’re in South Africa. And don’t forget to check out Francis Knight’s official website here. You can also read an excerpt from the first chapter of Fade to Black here.